Acoustic duo Jeff Falconer and Dennis Cordellos explore a rich variety of song styles, reflecting their eclectic experience and tastes, with stellar guitar work, soothing vocals, and questionable humor. 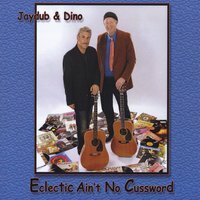 The acoustic duo Jaydub and Dino is comprised of Jeff Falconer and Dennis Cordellos, two Sonoma Valley, CA natives who've been playing together off and on since 1967! Our heroes both enjoyed long stints as professional rockers, playing in many different groups. Notably, Dennis was long based in Phoenix with Pacific Coast Highway and Jeff in Atlanta with Seymour Light. The lads eventually "grew up", started families, returned to the stream where they were spawned- Sonoma County, CA- and began playing together again in the early 1990's. Jaydub and Dino was formed in 2006, and their debut disc "Porch Groove" was released the following year. Jeff has other solo discs to his credit, and Dennis is currently lead guitarist with Bay Area favorites the Jami Jamison Band.